To Cite: Rezaee-Zavareh M S, Ajudani R, Khosravi M H, Ramezani-Binabaj M, Rostami Z, et al. 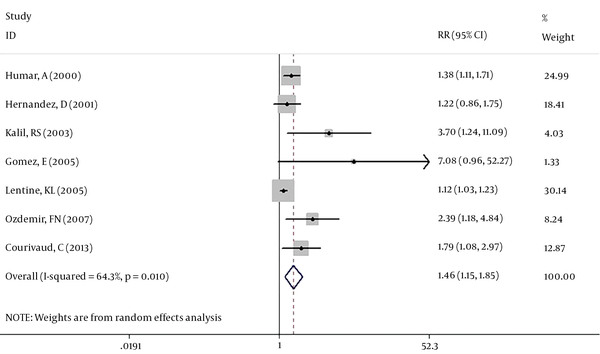 Effect of Cytomegalovirus Exposure on the Atherosclerotic Events Among Kidney-Transplanted Patients, A Systematic Review and Meta-Analysis, Nephro-Urol Mon. 2018 ; 10(4):e63900. doi: 10.5812/numonthly.63900. Context: Atherosclerosis is considered as the important cause of death worldwide and especially among kidney-transplanted patients. It is said that an aggressive intervention is needed for preventing new atherosclerotic events post kidney transplantation. Our main purpose was to determine the effect of cytomegalovirus (CMV) exposure on the atherosclerotic events among kidney-transplanted patients using a systematic review and meta-analysis. Evidence Acquisition: Electronic databases (PubMed, Scopus, Science Direct, and Web of Science) were systematically searched to find related studies for the effect of CMV exposure on the atherosclerosis in the kidney transplantation setting. Quality assessment was done and then because of existence of heterogeneity we used random-effect model to calculate risk ratio (RR) and 95% confidence interval (CI) for the CMV effect on the atherosclerosis. Results: Ten Studies were included in our systematic review. Eight of them proposed CMV as a risk factors for atherosclerosis among kidney-transplanted patients. According to available data for analysis, seven papers were included in our meta-analysis and showed RR of 1.46 (95% CI: 1.15 - 1.85) for the mentioned effect and based on the trim and fill method the corrected RR was as 1.26 (95% CI: 1.01 - 1.65). Conclusions: Our meta-analysis showed that exposure with CMV can lead to atherosclerosis events among kidney-transplanted patients. However, more original studies are still needed to explore the association between the type of CMV exposure and atherosclerotic events. Coronary heart disease (CHD), cerebrovascular disease (CVD), and peripheral vascular disease (PVD) have a common basic and underlying etiology called atherosclerosis. It is reported that in the United States, 795000 cases had new or recurrent stroke each year from 2000 to 2010 (1). Also, cardiovascular disease is considered as a major cause of mortality among kidney-transplanted patients and major intervention suggested for reducing this issue (2-4). Atherosclerosis is a chronic inflammatory disease of arteries (4) which can be started by some traditional risk factors such as hypertension and high plasma levels of cholesterol (5). However, it is now accepted that all process of initiation and development of atherosclerosis cannot be related just to these traditional risk factors. Hence, new theories about the role of infection and inflammation have emerged for atherosclerotic process and some infectious agent like helicobacter pylori and cytomegalovirus (CMV) has been addressed here (6-10). CMV exposure is present in more than two-thirds of donors and recipients (11). This virus can be transmitted from donors to recipients via blood transfusion or kidney transplantation. Some complications among kidney-transplanted patients like higher morbidity, mortality, infection and graft loss are associated with CMV as the most important and common opportunistic viral infection in this group of patients (12-14). Evidence associates CMV exposure with the higher rate of atherosclerotic events among patients with kidney transplantation (15, 16). In contrast some others rule out the existence of this association and propose that CMV cannot be a significant risk factor for atherosclerosis in these patients (17, 18). Considering the importance of atherosclerosis process and inconsistent results for its relationship with CMV exposure among kidney-transplanted patients, we tried to evaluate this relationship with a systematic review and meta-analysis. In this systematic review and meta-analysis projects, electronic databases and resources including PubMed, Scopus, Science Direct, and Web of Science were systematically and comprehensively searched. Also, for finding any possible grey literature, we searched Google scholar and after finding the last related article, we continued the search until we reached 50 serial unrelated links to our topic. After all, we checked the reference lists of all finally included papers to retrieve any missing papers in the electronic search. Studies were eligible for our systematic review if they have an appropriate study design (cross-sectional, case-control and cohort) and also evaluated effect of CMV exposure (Seropositivity, replication, infection, and disease) on the atherosclerosis among kidney transplanted patients. Based on the review of related literatures, we considered four major groups for atherosclerotic events in our project including; 1, coronary heart diseases (CHD) (angina, myocardial infarction (MI), heart failure and arrhythmia due to CHD); 2, cerebrovascular diseases (CVD) (cerebrovascular accident (CVA), transient ischemic attack (TIA) and carotid involvement); 3, involvement of abdominal aorta and 4, peripheral vascular diseases (PVD). Also we considered any death due to these four groups as an included outcome in our systematic review. The reviewing and screening process of articles was according to the PRISMA guideline for reporting of systematic review (19). Before reviewing the articles, we set a meeting about inclusion and exclusion criteria and reviewers were trained about questions in this issue. Then Two independent groups ((MSR and RA) and (MR-B and MHK)) evaluated 50 articles. At this time, we set the second meeting and discussed the disagreements. Although Kappa coefficient between reviewers was calculated. Each group screened about half of the papers and if both group members were agreed about a paper, it was included. However, if there were any uncertainties about a paper, it was referred to the third reviewers (BE) and the discrepancies were resolved by discussion and consensus. Quality assessment of included papers was done using the “Newcastle-Ottawa scale (NOS) for assessing the quality of nonrandomized studies in meta-analyses” (20). A pre-defined data extraction form was designed and data and outcome from included articles extracted into it. The data items were name, publication year, country and sample size of the study, patients’ age and gender, follow-up time and duration of dialysis; and the outcome was related to the relationship between CMV exposure and atherosclerosis events. For assessment of heterogeneity, the chi-squared and I- squared (takes values from 0% to 100%) tests with the combination of viewing the forest plot were used. P value less than 0.1 was considered significant for the chi-squared test. The combination of all of the mentioned tests was applied for making final decision about heterogeneity. Based on the results of heterogeneity tests, random-effect model (with metan command) were used for calculating the pooled risk ratio (RR), 95% confidence interval (CI) and P value. All statistical calculation was performed using STATA 10. We identified 1237 references via database searching, Forty-nine references were duplicated and 1188 papers included in our screening process. As it can be seen in Figure 1, we assessed 47 of full-text articles for eligibility. Ultimately ten papers met our inclusion criteria and included in our systematic review. The reviewers have a good agreement for study selection (Kappa coefficient was 0.85). Also, no study was excluded according to the quality assessment. Characteristics of included papers in our project have been shown in Table 1. All papers were published after year 2000. Four papers were form USA and 2 from turkey. Spain, United kingdoms, and France. Australia and New Zealand, each one had one paper about the topic. Abbreviations: D, Donor; M, Mean ± SD, Mean ± Standard Deviation; No., Number; ND, Not Determined; R, Recipient. There were different identification methods for CMV in the included papers. Enzyme‐linked immunoabsorbent assay (ELISA), polymerase chain reaction (PCR), nested PCR, virus culture (including blood and urine culture) were some of them. Also, different definitions about CMV had been used in these papers for final analysis which were Seropositivity, replication, infection, disease and exposure of CMV. Data about identification methods and definition for CMV of each included papers are shown in Table 2. As we pointed it before, we used CMV exposure as our definition covering all previously mentioned definitions for CMV. Abbreviations: D, Donor; ELIZA, Enzyme‐Linked Immunoabsorbent Assay. ; IgG, Immunoglobulin G; IgM, Immunoglobulin M; KTX, Kidney Transplantation; ND, Not Determined; MV, Cytomegalovirus; PCR, Polymerase Chain Reaction; R, Recipient. Like CMV and considering Table 3, data about diagnosis methods and definitions of atherosclerosis in each study were different. Four major categories for atherosclerosis including coronary artery disease (like angina, MI), cerebrovascular disease (like CVA, TIA and carotid involvement), the existence of atherosclerosis in abdominal aorta and peripheral vascular disease were found in the included papers. Abbreviations: CABG, Coronary Artery Bypass Graft; CHD, Coronary Heart Disease; CHF, Congestive Heart Failure; CMV, Cytomegalovirus; CT, Computed Tomography; CVA, Cerebrovascular Accident; CVD, Cerebrovascular Disease; EKG, Electrocardiography; IHD, Ischemic Heart Disease; ND, Not Determined; MI, Myocardial Infarction; MRI, Magnetic Resonance Imaging; TIA, Transient Ischemic Attack. Seven studies (39759 cases) were included in our meta-analysis. Based on the Chi-squared (chi2 = 16.79, DF = 6, P = 0.01), I-squared (I2 = 64.3%, P = 0.01) and Tau-squared (tau2 = 0.04) tests and also considering forest plot, there was significant heterogeneity between the studies, so pooled RR for the effect of CMV exposure on the atherosclerosis among kidney transplanted patients was calculated based on the random-effect model (RR: 1.46, 95% CI: 1.15 - 1.85) (Figure 2). Two studies (Humar, A (2) and Kalil RS (3)) have considered some cardiac complications like heart failure and arrhythmia as a related outcome to the atherosclerosis. So a separate analysis was done without these two studies and pooled RR was calculated as RR: 1.45, 95%CI: 1.06 - 1.99 (Figure 3). To investigate the presence of publication bias, the egger test was done and its coefficient was 2.051, (P = 0.001) indicating publication bias in our meta-analysis. The trim and fill method was used as a solution for overcoming this bias. This method tries to estimate the missed studies and uses them in the meta-analysis. After using this approach, the pooled RR was calculated as 1.26, 95% CI: 1.01 - 1.65, P value = 0.03 in the random-effect model. Although there were some other papers met our inclusion criteria, we could not use of them in the meta-analysis because of the insufficient data and different or undetermined definitions of atherosclerosis and CMV compared with our determined definitions. Here, we explain results of these studies which we included them only in the systematic review. In a study by Toz et al. effect of previous CMV disease on the thickness of intima-media (TIM) of common carotid artery (CCA), as a factor for atherosclerosis, has been investigated in 102 kidney transplanted patients. It is reported that patients with different TIM had non-significant percentage of previous CMV disease. (13% for TIM < 0.50 mm, 18% for 0.50 mm < TIM < 0.70 and 25% for TIM > 0.70 mm) (18). Methods for diagnosis of CMV and atherosclerosis have not mentioned in Le Page et al.’s paper. Furthermore, type of CHD was not clear in this paper. In addition, they included patients suspected to CHD in their analysis. This paper reported that 18.3% of D+/R +, 13.4% of D+/R-, 15.9% of D-/R+ and 12.5% of D-/R- had CHD or were suspected to CHD (P < 0.05) (16). de Mattos et al. evaluated the effect of CMV on the CHD, CVD and PVD independently. Also, they considered prior CMV infection in their final analysis and we could not include this paper for our meta-analysis. A total of 922 kidney-transplanted patients were evaluated in this paper and 176 patients experienced 201 atherosclerotic events during follow-up time (111 cardiac events, 48 CVD and 42 PVD). Among cases with cardiac events 79 subjects had prior CMV infection (P = 0.49). A significant effect of CMV infection (P = 0.03) on CVD in the univariate analysis has been also reported. Finally, in the best-reduced model, a hazard ratio of 3.88 (95% CI: 2.06 - 7.31 P < 0.001) for effect of tobacco and prior CMV infection on atherosclerosis has been reported (16). 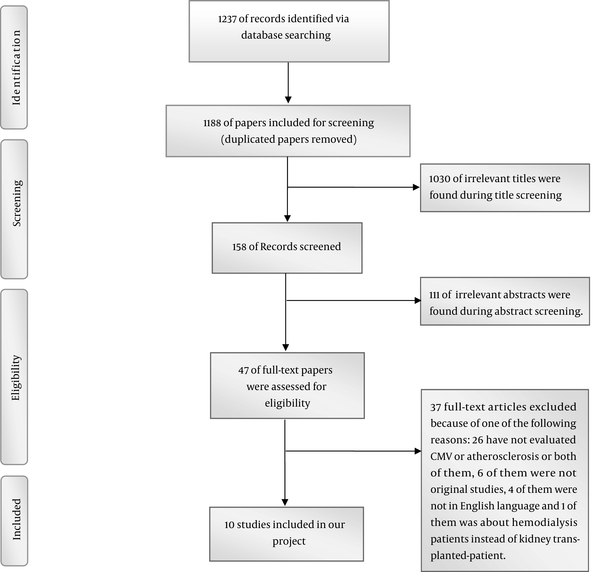 This project was the first systematic review and meta-analysis about the relationship between CMV exposure and atherosclerotic events among kidney transplanted patients. Eight of 10 included papers have reported CMV exposure as a significant risk factor for atherosclerosis. Considering seven studies with 39759 cases in our meta-analysis, we showed that CMV exposure has a significant effect on the atherosclerotic event among this group of patients. Atherosclerosis is considered as a chronic disease of blood vessels. Lipid accumulation and endothelial dysfunction are important responsible factors in this process (28, 29). Also, it has been proved that chronic inflammation has a significant role in the development of atherosclerosis. In addition to lipid particles like cholesterol, some of the immune cells such as macrophage and T cells has been seen in atherosclerotic lesions (30). Both innate and adaptive immune mechanism can be involved as a response to inflammation (31) and this inflammation can also help to transduce the effects of many traditional risk factors for atherosclerosis process (29, 32). One of the suggested contributors to the atherosclerosis is infectious agents. Sero-epidemiological projects with different methods like finding of infectious agents in atherosclerotic plaques have shown that some bacteria and viruses are correlated to atherosclerosis (28). Hepatitis C, Helicobacter pylori, and Chlamydia pneumonia are some of these agents (33-35). CMV infection is another proposed agent that is involved in the process of atherosclerosis. With the increase in the number of immunosuppressed subjects like patients undergoing immunosuppressive therapy after transplantation, the importance of CMV infection has also increased (36). Infection can lead to inflammation which is effective in the process of atherosclerosis. There are two mentioned mechanisms for this effect (28, 37). One is related to the inflammation at the site of blood vessels (Intima). It can affect the modification and deposition of lipid (37). CMV-DNA has been detected in the atherosclerotic tissues and aortic plaques (7, 38, 39) and also antigens of CMV has been seen in smooth muscle cells of blood vessels wall (40). It is reported that CMV replication can lead to proliferation and migration of smooth muscle cells (41). Another mechanism is associated with inflammation at the non-vascular sites. It is thought that Cytokines and other factors that is produced at non-vascular sites can be carried out to the wall of blood vessels (37). Dysfunction of HDL due to inflammation is another proposed way of the second mechanism (42). In kidney transplanted patients a higher amount of immune cells has been seen (26). T cells that are specific for CMV are potent effector that can secrete cytokines upon stimulation (43). CD4 Positive T cells are related to instable atherosclerotic plaques (44, 45). Also there are evidences that show CMV can increase growth factors secretion and expression of molecular adhesion of endothelial cells. These increases are considered relevant to changes that are exist in the process of atherosclerosis (25). Cardiovascular disease as a clinical outcome of atherosclerosis is the important cause of death worldwide and especially among kidney transplanted patients (3, 30). It is said that an aggressive intervention is needed for preventing new Cardiovascular diseases in the first year of post kidney transplantation (2). End-stage renal disease (ESRD) can be considered as a risk factor for atherosclerosis (46, 47). Some studies have investigated the effect of CMV on the atherosclerosis among ESRD patients. In a study in 2004 with evaluation of 267 ESRD patients, it has been showed that past infection with CMV has no correlation with atherosclerosis disease but this correlation exists for past infection with Helicobacter pylori and Chlamydia pneumonia (48). In contrast with the results of this study, a retrospective project in 2007 with investigation of 408 ESRD subjects have concluded that CMV is significantly associated with atherosclerosis disease. It should be noted that like our study, all four groups of atherosclerosis (CHD, CVD, involvement of abdominal aorta and carotid artery) had been considered in this study (49). Among the evidence investigating relationship between CMV and atherosclerosis, some of them rejecting this relationship. For instance, there are two papers about the relationship of intima-media thinness of carotid and CMV in HIV-infected patients (50) and in kidney transplanted subjects (18) rejecting this association. However, in a meta-analysis of 55 studies including 17608 cases, an odds ratio (OR) of 1.67 (95% CI, 1.56, 1.79) has been reported for the effect of CMV on the coronary heart disease. The CMV was a risk factor in both Asian and non-Asian groups and also in both prospective and retrospective studies. Also, the OR was greater in studies have used PCR than ELISA (51). Unfortunately, and because of limitation in number of included studies in our project we could not run a subgroup analysis about identification methods for CMV and Atherosclerosis. The analysis that seems to be necessary for our project with consideration of available heterogeneity. The sample size of Meta-analyses is comprised of original articles. The increase in the number of original papers can help to increase the power of Meta-analyses. In this project, we could only find seven papers related to the topic of our meta-analysis. So the number available studies for including in the analysis was our main limitation. On the other hand, among included papers, we could not extract some of the suitable data for running subgroup analysis or including them in the meta-regression analysis. Some of these data are related to the duration of dialysis before transplantation and follow-up time. As we said before loss of renal function can be considered as a risk factor for atherosclerosis and also it should be taken into account that difference in the duration of follow up of patients after transplantation can lead to the different number of atherosclerotic events in a study. The other limitation in our study was related to the different method of CMV and atherosclerotic diagnosis in different studies and as we mentioned it before we did not have enough study to run subgroup analysis about this important issue. There is a need to have more original studies about the topic to run more powerful analysis about the identification method of CMV. However, preventing kidney transplanted patients from exposure to CMV can be effective to reduce the number of atherosclerosis events among these patients. Authors’ Contribution: concept and design, Behzad Einollahi, data acquisition, Mohammad Saeid Rezaee-Zavareh, Mohammad Hossein Khosravi, Reza Ajudani, Mahdi Ramezani-Binabaj, Behzad Einollahi, Zohreh Rostami; data analysis, Mohammad Saeid Rezaee-Zavareh, Behzad Einollahi, Zohreh Rostami; drafting the manuscript, Mohammad Saeid Rezaee-Zavareh, Mahdi Ramezani-Binabaj; critical revising of the manuscript, Behzad Einollahi, Zohreh Rostami, Mohammad Hossein|Khosravi, Reza Ajudani; final approval of the manuscript, All Authors. Conflict of Interest: Authors declare that there is no conflict of interest in this project. 1. Lloyd-Jones D, Adams R, Carnethon M, De Simone G, Ferguson TB, Flegal K, et al. Heart disease and stroke statistics--2009 update: a report from the American Heart Association Statistics Committee and Stroke Statistics Subcommittee. Circulation. 2009;119(3):e21-181. doi: 10.1161/CIRCULATIONAHA.108.191261. [PubMed: 19075105]. 2. Laures AS, Gomez E, Baltar J, Alvarez-Grande J. Risk factors for cardiovascular disease during the first 2 years after renal transplantation. Transplant Proc. 2005;37(9):3778-81. doi: 10.1016/j.transproceed.2005.09.201. [PubMed: 16386536]. 3. Kasiske BL, Guijarro C, Massy ZA, Wiederkehr MR, Ma JZ. Cardiovascular disease after renal transplantation. J Am Soc Nephrol. 1996;7(1):158-65. [PubMed: 8808124]. 4. Arashnia R, Roohi-Gilani K, Karimi-Sari H, Nikjoo N, Bahramifar A. Effect of pioglitazone therapy on high sensitive C-reactive protein and lipid profile in diabetic patients with renal transplantation; a randomize clinical trial. J Nephropathol. 2015;4(2):48-53. doi: 10.12860/jnp.2015.10. [PubMed: 25964889]. [PubMed Central: PMC4417670]. 5. Ramji DP, Davies TS. Cytokines in atherosclerosis: Key players in all stages of disease and promising therapeutic targets. Cytokine Growth Factor Rev. 2015;26(6):673-85. doi: 10.1016/j.cytogfr.2015.04.003. [PubMed: 26005197]. [PubMed Central: PMC4671520]. 6. Kozarov E, Huber K, Wojta J. Infection-associated biomarkers of inflammation in atherosclerosis. Curr Pharm Des. 2015;21(13):1776-82. [PubMed: 25435361]. 7. Heybar H, Alavi SM, Farashahi Nejad M, Latifi M. Cytomegalovirus infection and atherosclerosis in candidate of coronary artery bypass graft. Jundishapur J Microbiol. 2015;8(3). e15476. doi: 10.5812/jjm.15476. [PubMed: 25834719]. [PubMed Central: PMC4377172]. 8. Adiloglu AK, Can R, Nazli C, Ocal A, Ergene O, Tinaz G, et al. Ectasia and severe atherosclerosis: relationships with chlamydia pneumoniae, helicobacterpylori, and inflammatory markers. Tex Heart Inst J. 2005;32(1):21-7. [PubMed: 15902817]. [PubMed Central: PMC555817]. 9. Rezaee-Zavareh MS, Tohidi M, Sabouri A, Ramezani-Binabaj M, Sadeghi-Ghahrodi M, Einollahi B. Infectious and coronary artery disease. ARYA Atheroscler. 2016;12(1):41-9. [PubMed: 27114736]. [PubMed Central: PMC4834180]. 10. Ramezani-Binabaj M, Mobasher-Jannat A, Safiabadi M, Saburi A, Rezaee-Zavareh MS, Karimi-Sari H. The Relationship between Helicobacter pylori Infection and Atherosclerosis: A Meta-analysis. Erciyes Med J. 2016;38(3):90-4. doi: 10.5152/etd.2016.0030. 11. Rubin RH. Infectious disease complications of renal transplantation. Kidney Int. 1993;44(1):221-36. doi: 10.1038/ki.1993.234. [PubMed: 8394951]. 12. Buchler M, Hurault de Ligny B, Madec C, Lebranchu Y, French Thymoglobuline Pharmacovigilance Study G. Induction therapy by anti-thymocyte globulin (rabbit) in renal transplantation: a 1-yr follow-up of safety and efficacy. Clin Transplant. 2003;17(6):539-45. doi: 10.1046/j.1399-0012.2003.00102.x. [PubMed: 14756271]. 13. Burke G3, Kaufman DB, Millis JM, Gaber AO, Johnson CP, Sutherland DE, et al. Prospective, randomized trial of the effect of antibody induction in simultaneous pancreas and kidney transplantation: three-year results. Transplantation. 2004;77(8):1269-75. doi: 10.1097/01.TP.0000123903.12311.36. [PubMed: 15114097]. 14. Bal Z, Uyar ME, Tutal E, Erdogan E, Colak T, Sezer S, et al. Cytomegalovirus infection in renal transplant recipients: one center's experience. Transplant Proc. 2013;45(10):3520-3. doi: 10.1016/j.transproceed.2013.08.098. [PubMed: 24314948]. 15. Le Page AK, Mackie FE, McTaggart SJ, Kennedy SE. Cytomegalovirus & Epstein Barr Virus serostatus as a predictor of the long-term outcome of kidney transplantation. Nephrology (Carlton). 2013;18(12):813-9. doi: 10.1111/nep.12149. [PubMed: 23927085]. 16. de Mattos AM, Prather J, Olyaei AJ, Shibagaki Y, Keith DS, Mori M, et al. Cardiovascular events following renal transplantation: role of traditional and transplant-specific risk factors. Kidney Int. 2006;70(4):757-64. doi: 10.1038/sj.ki.5001628. [PubMed: 16788687]. 17. Hernandez D, Hanson E, Kasiske MK, Danielson B, Roel J, Kasiske BL. Cytomegalovirus disease is not a major risk factor for ischemic heart disease after renal transplantation. Transplantation. 2001;72(8):1395-9. doi: 10.1097/00007890-200110270-00011. [PubMed: 11685110]. 18. Toz H, Duman S, Altunel E, Sezis M, Ozbek S, Ozkahya M, et al. Intima media thickness as a predictor of atherosclerosis in renal transplantation. Transplant Proc. 2004;36(1):156-8. doi: 10.1016/j.transproceed.2003.11.058. [PubMed: 15013331]. 19. Moher D, Liberati A, Tetzlaff J, Altman DG. Preferred reporting items for systematic reviews and meta-analyses: the PRISMA statement. Ann Int Med. 2009;151(4):264-9. 20. Wells GA, Shea B, O'Connell D, Peterson J, Welch V, Losos M, et al. The Newcastle-Ottawa Scale (NOS) for assessing the quality of nonrandomised studies in meta-analyses. 2018. Available from: http://www.ohri.ca/programs/clinical_epidemiology/oxford.asp. 21. Humar A, Gillingham K, Payne WD, Sutherland DE, Matas AJ. Increased incidence of cardiac complications in kidney transplant recipients with cytomegalovirus disease. Transplantation. 2000;70(2):310-3. doi: 10.1097/00007890-200007270-00013. [PubMed: 10933155]. 22. Kalil RS, Hudson SL, Gaston RS. Determinants of cardiovascular mortality after renal transplantation: a role for cytomegalovirus? Am J Transplant. 2003;3(1):79-81. doi: 10.1034/j.1600-6143.2003.30114.x. [PubMed: 12492715]. 23. Gomez E, Laures A, Baltar JM, Melon S, Diez B, de Ona M. Cytomegalovirus replication and "herpesvirus burden" as risk factor of cardiovascular events in the first year after renal transplantation. Transplant Proc. 2005;37(9):3760-3. doi: 10.1016/j.transproceed.2005.08.058. [PubMed: 16386530]. 24. Lentine KL, Brennan DC, Schnitzler MA. Incidence and predictors of myocardial infarction after kidney transplantation. J Am Soc Nephrol. 2005;16(2):496-506. doi: 10.1681/ASN.2004070580. [PubMed: 15615820]. 25. Ozdemir FN, Akgul A, Altunoglu A, Bilgic A, Arat Z, Haberal M. The association between cytomegalovirus infection and atherosclerotic events in renal transplant recipients. Transplant Proc. 2007;39(4):990-2. doi: 10.1016/j.transproceed.2007.02.026. [PubMed: 17524871]. 26. Courivaud C, Bamoulid J, Chalopin JM, Gaiffe E, Tiberghien P, Saas P, et al. Cytomegalovirus exposure and cardiovascular disease in kidney transplant recipients. J Infect Dis. 2013;207(10):1569-75. doi: 10.1093/infdis/jit064. [PubMed: 23417659]. 27. Alpert JS, Thygesen K, Antman E, Bassand JP. Myocardial infarction redefined--a consensus document of The Joint European Society of Cardiology/American College of Cardiology Committee for the redefinition of myocardial infarction. J Am Coll Cardiol. 2000;36(3):959-69. doi: 10.1016/S0735-1097(00)00804-4. [PubMed: 10987628]. 28. Campbell LA, Rosenfeld ME. Infection and Atherosclerosis Development. Arch Med Res. 2015;46(5):339-50. doi: 10.1016/j.arcmed.2015.05.006. [PubMed: 26004263]. [PubMed Central: PMC4524506]. 29. Libby P, Ridker PM, Hansson GK. Progress and challenges in translating the biology of atherosclerosis. Nature. 2011;473(7347):317-25. doi: 10.1038/nature10146. [PubMed: 21593864]. 30. Hansson GK, Hermansson A. The immune system in atherosclerosis. Nat Immunol. 2011;12(3):204-12. doi: 10.1038/ni.2001. [PubMed: 21321594]. 31. Hansson GK, Libby P, Schonbeck U, Yan ZQ. Innate and adaptive immunity in the pathogenesis of atherosclerosis. Circ Res. 2002;91(4):281-91. doi: 10.1161/01.RES.0000029784.15893.10. [PubMed: 12193460]. 32. Hansson GK. Inflammation, atherosclerosis, and coronary artery disease. N Engl J Med. 2005;352(16):1685-95. doi: 10.1056/NEJMra043430. [PubMed: 15843671]. 33. Chen J, Zhu M, Ma G, Zhao Z, Sun Z. Chlamydia pneumoniae infection and cerebrovascular disease: a systematic review and meta-analysis. BMC Neurol. 2013;13:183. doi: 10.1186/1471-2377-13-183. [PubMed: 24261578]. [PubMed Central: PMC4222774]. 34. Wang ZW, Li Y, Huang LY, Guan QK, Xu DW, Zhou WK, et al. Helicobacter pylori infection contributes to high risk of ischemic stroke: evidence from a meta-analysis. J Neurol. 2012;259(12):2527-37. doi: 10.1007/s00415-012-6558-7. [PubMed: 22688569]. 35. Huang H, Kang R, Zhao Z. Is hepatitis C associated with atherosclerotic burden? A systematic review and meta-analysis. PLoS One. 2014;9(9). e106376. doi: 10.1371/journal.pone.0106376. [PubMed: 25184517]. [PubMed Central: PMC4153605]. 36. Streblow DN, Dumortier J, Moses AV, Orloff SL, Nelson JA. Mechanisms of cytomegalovirus-accelerated vascular disease: induction of paracrine factors that promote angiogenesis and wound healing. Curr Top Microbiol Immunol. 2008;325:397-415. [PubMed: 18637518]. [PubMed Central: PMC2699259]. 37. Rosenfeld ME. Inflammation and atherosclerosis: direct versus indirect mechanisms. Curr Opin Pharmacol. 2013;13(2):154-60. doi: 10.1016/j.coph.2013.01.003. [PubMed: 23357128]. [PubMed Central: PMC3654071]. 38. Hulshof JW, Casarosa P, Menge WM, Kuusisto LM, van der Goot H, Smit MJ, et al. Synthesis and structure-activity relationship of the first nonpeptidergic inverse agonists for the human cytomegalovirus encoded chemokine receptor US28. J Med Chem. 2005;48(20):6461-71. doi: 10.1021/jm050418d. [PubMed: 16190772]. 39. Jeong SJ, Ku NS, Han SH, Choi JY, Kim CO, Song YG, et al. Anti-cytomegalovirus antibody levels are associated with carotid atherosclerosis and inflammatory cytokine production in elderly Koreans. Clin Chim Acta. 2015;445:65-9. doi: 10.1016/j.cca.2015.03.015. [PubMed: 25797894]. 40. Melnick JL, Petrie BL, Dreesman GR, Burek J, McCollum CH, DeBakey ME. Cytomegalovirus antigen within human arterial smooth muscle cells. Lancet. 1983;2(8351):644-7. doi: 10.1016/S0140-6736(83)92529-1. [PubMed: 6136795]. 41. Simanek AM, Dowd JB, Pawelec G, Melzer D, Dutta A, Aiello AE. Seropositivity to cytomegalovirus, inflammation, all-cause and cardiovascular disease-related mortality in the United States. PLoS One. 2011;6(2). e16103. doi: 10.1371/journal.pone.0016103. [PubMed: 21379581]. [PubMed Central: PMC3040745]. 42. Fisher EA, Feig JE, Hewing B, Hazen SL, Smith JD. High-density lipoprotein function, dysfunction, and reverse cholesterol transport. Arterioscler Thromb Vasc Biol. 2012;32(12):2813-20. doi: 10.1161/ATVBAHA.112.300133. [PubMed: 23152494]. [PubMed Central: PMC3501261]. 43. van Leeuwen EM, Remmerswaal EB, Vossen MT, Rowshani AT, Wertheim-van Dillen PM, van Lier RA, et al. Emergence of a CD4+CD28- granzyme B+, cytomegalovirus-specific T cell subset after recovery of primary cytomegalovirus infection. J Immunol. 2004;173(3):1834-41. doi: 10.4049/jimmunol.173.3.1834. [PubMed: 15265915]. 44. Sato K, Niessner A, Kopecky SL, Frye RL, Goronzy JJ, Weyand CM. TRAIL-expressing T cells induce apoptosis of vascular smooth muscle cells in the atherosclerotic plaque. J Exp Med. 2006;203(1):239-50. doi: 10.1084/jem.20051062. [PubMed: 16418392]. [PubMed Central: PMC2118078]. 45. Liuzzo G, Goronzy JJ, Yang H, Kopecky SL, Holmes DR, Frye RL, et al. Monoclonal T-cell proliferation and plaque instability in acute coronary syndromes. Circulation. 2000;101(25):2883-8. doi: 10.1161/01.CIR.101.25.2883. [PubMed: 10869258]. 46. Shlipak MG, Fried LF, Cushman M, Manolio TA, Peterson D, Stehman-Breen C, et al. Cardiovascular mortality risk in chronic kidney disease: comparison of traditional and novel risk factors. JAMA. 2005;293(14):1737-45. doi: 10.1001/jama.293.14.1737. [PubMed: 15827312]. 47. Muntner P, He J, Astor BC, Folsom AR, Coresh J. Traditional and nontraditional risk factors predict coronary heart disease in chronic kidney disease: results from the atherosclerosis risk in communities study. J Am Soc Nephrol. 2005;16(2):529-38. doi: 10.1681/ASN.2004080656. [PubMed: 15625072]. 48. Wolf SC, Brehm BR, Mayer O, Jurgens S, Schultze G, Risler T. Infectious risk factors for atherosclerotic vascular disease in hemodialysis patients--Chlamydia pneumoniae but not Helicobacter pylori or cytomegalovirus is associated with increased C-reactive protein. Ren Fail. 2004;26(3):279-87. doi: 10.1081/JDI-120039527. [PubMed: 15354978]. 49. Betjes MG, Litjens NH, Zietse R. Seropositivity for cytomegalovirus in patients with end-stage renal disease is strongly associated with atherosclerotic disease. Nephrol Dial Transplant. 2007;22(11):3298-303. doi: 10.1093/ndt/gfm348. [PubMed: 17597084]. 50. Goulenok T, Boyd A, Larsen M, Fastenackels S, Boccara F, Meynard JL, et al. Increased carotid intima-media thickness is not associated with T-cell activation nor with cytomegalovirus in HIV-infected never-smoker patients. AIDS. 2015;29(3):287-93. doi: 10.1097/QAD.0000000000000539. [PubMed: 25686677]. 51. Ji YN, An L, Zhan P, Chen XH. 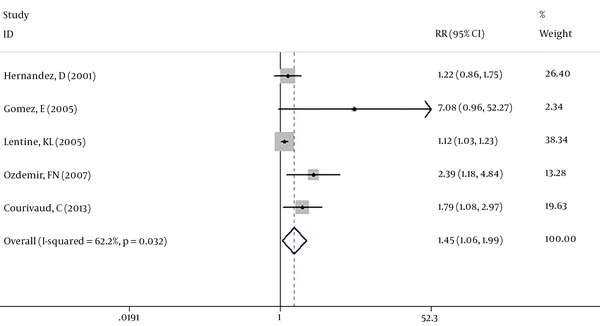 Cytomegalovirus infection and coronary heart disease risk: a meta-analysis. Mol Biol Rep. 2012;39(6):6537-46. doi: 10.1007/s11033-012-1482-6. [PubMed: 22311014].